The city famous for Elvis, Beale Street, and the Blues is also home to a company now celebrated in virtual team circles. Buckman Labs is a long-time innovator with its problem-solving, customer-centric, globe-circling “knowledge transfer” network. After more than a decade of pioneering, Buckman has answered many questions that other companies are just starting to ask. Buckman Labs, with $300 million in revenues, provides specialty chemicals to the pulp and paper, water, and leather industries. Buckman products allow contamination-free manufacture of paper products, swimming pools without algae, and leather for Toyota and Lexus car seats. Bob Buckman, chairman and CEO of Bulab Holdings, Inc., the parent company of Buckman Labs, takes a small note card and a pen from his breast pocket and draws a little picture to illustrate his vision. “The number of connections among people multiplies exponentially when all are linked point-to-point,” he says, putting his pen to the mid-points where the connections between the people intersect. You need a company where everyone has access to the collective intelligence of the organization regardless of time or space, he believes. Buckman inherited his company from his parents, Stanley and Mertie, who start Buckman Laboratories in 19451 with five employees in the small back-office of a former lumberyard not far from Café Society, the popular Memphis eatery where we’re having lunch. Their one customer, Whiting Paper Company, needs their product, a microbicide that three years later becomes the industry standard. The company begins its steady growth until 1978 when things change suddenly: Bob’s father dies at the office of a heart attack. Bob unexpectedly finds himself chief executive. Buckman Labs is a different company from the one his parents had started. When he takes over, the company is well on its way to being the firm it is today. The enterprise comprises operations in 22 countries, employing 1250 people speaking 15 languages, and producing more than a thousand products. Bob also has a different management style from his father. Twenty-six people reported directly to “Dr. Stanley,” an unworkable structure in his son’s estimation. So from his earliest days, “Bob” works to create a less bureaucratic, more responsive, and very intelligent organization. In his speeches, Buckman refers to 1984 as the starting point for his company’s “journey—it’s not a project,” he says2. That year he meets the author, Tom Peters, whose 1983 best-seller, In Search of Excellence, co-authored with Robert Waterman, revolutionizes how people look at their businesses (and breaks open the business-book industry). Buckman is among the first to attend Peters’ Skunkcamp, designed by Reuben Harris,3 Peters’ then-partner (the two had met as doctoral students at Stanford Graduate Business School), a week-long intensive on unconventional business ideas. Buckman eventually sends most of his senior management to the program. Fate intervenes again in 1989 when Buckman ruptures a disk that lays him flat on his back for several weeks. His mind has been on high-churn since meeting Peters and Harris who joins the Buckman board of directors, and he has been experimenting. But when he finds himself unable to even sit up, he realizes that if he can’t get to his office, he is completely cut off from work. He wonders: “Why do organizations spend huge sums of money on systems that only function 14 percent of the time?” He not only characterizes the lives of his executives, managers, and people in sales but also anticipates changes ahead. Buckman comes up with the idea that fits his immediate need and will catalyze the redesign of the company. He decides to put everyone online. In 1989, before the general commercial availability of the Internet, K’Netix is born, an online network that allows everyone in the company to talk to everyone else anywhere at any time. In a pre-web era, it's a major challenge to get thousands of people around the world comfortable with logging in every day to solicit and contribute advice to people they rarely if ever see. Technology. Everyone in the global Buckman has access to PCs and laptops. When they travel, they can take “electronic first aid” kits with them, equipped with whatever they will need for where they’re going (telephone connectors, adapters, and cables). Free, unrestricted access to the Internet. “We say, ‘Go play, go learn.’ People have to learn how to be comfortable with technology,” he says. Coaching and facilitation. For the first several years, coaches regularly spent 12 hours a day online just helping people become comfortable. Today, every online discussion area has its own moderator, many of whom have gone on to invent their own ways of working online. Alison Tucker, now director of Global Media and Promotions for Buckman, is the company’s original online coach and over the years has participated in each online innovation. The initial getting-to-know-one-another frenzy lasts for about three months when things begin to settle down into scientific and business conversations. To encourage company-wide participation, Buckman himself takes to the world circuit. He gives speeches on the role of knowledge transfer and his belief that the company’s intelligence lies “between the ears of the people, not in some database.” From the beginning, he is an active daily participant. “It has to have unequivocal leadership at the top,” he says. For the first six months of K’Netix, they run weekly reports to see who is participating and who is not. Every Friday morning, everyone in the company receives a report via e-mail listing the people who have not logged in by the previous afternoon. Buckman himself sends messages to these people asking why they aren't online and if they need any help. The desire to be absent from the list is so strong that they only need to run the reports for six months. Soon people are participating in dozens of knowledge-sharing meetings online. Customer problems that once took days to resolve can be answered in a few hours. By today’s stupefying technology standards, the Buckman Global Knowledge Network is—and remains—pretty elementary. After their first five years using a cumbersome IBM network that requires different codes for different countries, they move to CompuServe in 1992. CompuServe, now part of its once-arch rival America Online, also offers simple software for online discussions called “forums.” Each forum is on a separate topic and any authorized person can read and post messages. Because it captures everything electronically, the system maintains its own ongoing discussion history that can track decision-making and problem-solving. Buckman has numerous forums on topics germane to its business, including everything from customers to strategy to new product development. The forums are portable; when Buckman switches platforms again to Internet news-groups the forum topics continue. Buckman Labs’ customer, SAPPI, an Italian pressmaker early to automation, is planning a new system to bring out a new grade of paper in South Africa. “They sent a simple e-mail with their query and they got back 10 articles on how to do it. They were just amazed we would do this for them. Customers want us as consultants on how to solve their problems, but they also want us to bring in the product. We don't want to have to go three different places to solve the problem, procure the chemicals, and implement it in their production system,” Steve Buckman explains. “We built the architecture then plugged in everything we could find. I was reading how to do [Lotus] Notes development on a tour bus in Mexico, and my modem burned out, so I had to have a new one Fedexed. We worked day and night and threw a lot of things together very, very quickly.” Three-and-a-half weeks later, Bulabs Learning Center is operational with 75 courses available online. Today the Learning Center employs 10 people from Asia, South America, and the U.S. who speak 11 languages and come from a variety of specialties: a chemical engineer, an agronomist, a computer scientist, a paper-making scientist, a political scientist, and a Spanish linguist. Among their many ambitions is one to make the site fully accessible in the company’s four principal tongues—English, Spanish, Portuguese, and German. “There aren’t many others trying to do a multi-lingual, academic, technical, personal/professional, career-development, learning- center web site,” Ellis says. They offer “knowledge” in many media, including traditional face-to-face courses with hardcopy (they call it “stand up”). The Learning Center produces thousands of CDs, offers 500 online courses through partnerships with 20 universities, stores countless presentations and documents, and is developing new ideas by the day. “We’re constantly taking things up and down,” as Ellis puts it, regularly trying things out on the site. Buckman’s goal is to have 80 percent of the company “effectively engaged on the front line,” that is, directly connected with customer needs. “If you’re not doing something useful for a customer, why are you here?” He only has a few percentage points to go before having quintupled the number from 16 percent in 1979. A company like Buckman is the latest in a long line of innovations centered on small groups working together. As a species, we’ve been working on this form of organization for a long time. Over thousands of years, human life has spawned myriad small groups. To see what is special about teams we need to understand what’s common to all small groups. Then we can see what’s particular to virtual teams. Luckily, researchers have considerable agreement on how teams differ from groups—even if their precise definitions of them contrast. People become a group by virtue of doing things of mutual benefit together. A small group is not a random collection of people, like a crowd crossing a street or passengers on a plane. Groups of people have more, they have an inter-relatedness and common motivation that adds up to more than just a bunch of individuals. It is very rare that a new small group arises out of nowhere. Usually, small groups arise from pre-existing ones—the CFO network that grows out of a multi-national finance organization, the pick-up basketball team that follows the playground building project, the book club that grows out of the “art crit” group that grows out of the 50-something students at Massachusetts College of Art. Most small groups are part of networks and other larger organizations. Individual members of the group define its boundaries. What allows people to say they are “in” the group while others are “out?” People are on an e-mail distribution list establish themselves as members of that virtual group. If you are not on the list, you are not a member. Membership, as recognized by insiders and outsiders alike, gives a group its essential boundary. The second element of small groups is interaction—people connecting with people. Communication, the means of connection that provides pathways for human relationships, is inherently a shared activity. The third element is interdependence, which means what many people think of as “unifying purpose” or “shared goals.” Interdependence–joint purpose and shared motivation–is essential to form individuals into something more, a group. The words “individuals interacting” are not sufficient to define a small group. “Synergy” is the word Buckminster Fuller coined to describe the “something more” characteristic. In virtual teams, ephemeral synergy arises from purpose pursued. “We put the ‘x’ in dot-com” reads the in-joke marketing message among members of a product management group. Nonsense, anyone else would say. Not at all, replies the team. The “message” erupted in one of countless exchanges about how to position the product. The “x” itself then became a verb. For this team, “x-ing” something means applying the product’s power to it. Language, first invented in the earliest forager camps, continues to evolve all the time in groups today. Acronyms, stock phrases, and in-jokes are verbal indicators of group cohesion. Our company affectionately refers to our early product development stages as “hops.” We collectively speak millions of dialects whether in the small towns of Sicily or the web rooms of software development groups. They are our common tongues. For millennia, small group communications means that people talk to one another face-to-face, using the medium of sound waves traveling through air. We are genetically programmed to assume that most small group communication is face-to-face. But reality is changing. The move to virtual work is the most dramatic change in the nature of the small group since humans acquired the capacity to talk to one another. Orientation to task is what distinguishes teams from other types of small groups. While all small groups carry out tasks to some degree (as well as make decisions and support social interactions), task is the primary focus for teams. All other aspects are ancillary. While purpose is fundamental to all groups, teams are specifically, deliberately, and invariably about results. Tasks are the work, the common process that leads to results, the joint aspiration at the end. When they set goals, teams project their results and commit to the tasks required to carry them out. Tasks also create team boundaries. Certain members with special skills must be part of the group for success. Different members shape and reshape the purpose and tasks of the group. Indeed, the goals and tasks often exist before the team identifies its members. The feedback loop between task definition and appropriate membership becomes a core defining process during a team’s early development. While task distinguishes teams from small groups, boundary-crossing differentiates traditional teams and virtual ones. It is the day-in-and-day-out reality of communicating, interacting, and building relationships across space, time, and organizations that makes teams virtual. We once had a cat named Small, named for E.F. Schumacher’s famous dictum (and book), Small Is Beautiful.10 When it comes to people organizing effectively, small is indeed beautiful—and very old. Over the ages, we have become increasingly adept at being in small groups. When hierarchy came along, people did not stop meeting and performing in small numbers. When bureaucracy evolved, hierarchs did not throw down their scepters and call it a day. Industrial bureaucracies depend upon the small groups that populate their ranks and levels. While developing its own signature characteristics, each age also incorporates essential organizational features of the ones before it. 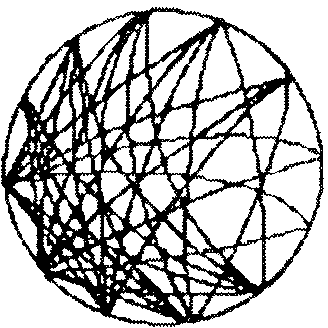 Networks, the organizations of the Information Age, incorporate aspects of their predecessors: Levels of hierarchies, specialties of bureaucracy, and clear membership of small groups. Old forms do not, however, endure unchanged. With each new age, new versions of old forms supplement the organizational repertoire. In our most basic everyday life, we are shaped by human experience millions of years old. Awareness of our long history in small groups (Figure 3.1) offers a bountiful source of experience to call upon as we spread our virtual wings. It’s in our social DNA. The mobile family, foraging to survive, is the basic social unit of the Nomadic Era. Relatively small, these families are partly self-sufficient and partly interdependent with other families. Together, they periodically set up camp in larger groups. Once in the camps, task groups naturally take shape. Hunters, gatherers, and traders join forces according to circumstance and need. The first teams are task-oriented groups in Nomadic Era camps. Camps also stimulate relationships outside the family. These “non-kin affinity networks,” as the anthropologists call them, allow people to have friends, share information, extend healing, encourage hobbies, enjoy leisure and recreation, and participate in adventures. Without cooperation across kin lines, humanity never would have gone beyond subsistence. These “virtual” kinships, what anthropologists call fictive kinships, were critical to human progress—and remain so. In the Agricultural Era, families grow larger and more extended. Farmers and herders, the new economic task units, crowd out hunters and gatherers. Skilled tool-makers evolve into artisans. With them come masters of the trade with their own small shops and apprentices. Society stratifies into castes and classes. Religious groups proliferate as common spiritual lives integrate larger communities inhabiting bigger societies. The great organizational structures of this time are ruling elites and military units. To protect land, agrarian settlements marshal military hierarchies to coerce people. But organized violence is not the only contribution of this age. The invention of hierarchy brings along a positive development: Clear efficient authority structures with ranks, small group units combining into ever-larger units. This innovation of multi-level social structure is a great leap forward in the human capacity to organize large numbers of people. At the same time, the first cornerstone of capitalism is laid. Military and religious leaders become owners of land previously held by the groups who lived on it. In economic terms, ownership reverberates to our own day as the ultimate source of coercive authority—the right to hire, fire, and sell. This timeless feature is the bedrock of hierarchical rights and responsibilities in companies. Executives confront an apparent dilemma when they try to team with one another because by their nature they are hierarchical decision makers. They actually have a dual nature—hierarchs who are guardians of supreme power and team members who are partners in power. Executive groups find it particularly difficult to be effective task teams. In the Industrial Age, the typical family size shrinks again, becoming more nuclear. While remaining key in society, the family abruptly ends its preeminence in the economic domain. Instead, segmented, specialized work rules. Task-oriented bureaucratic units become the basis for economic gain. Rules bind replicable operating units. The units in turn aggregate into larger mechanical processes that produce predictable results. Society views small groups of all sorts as interchangeable, replaceable parts of the machine organization. The great social invention of bureaucracy is formal representation under law. Here small groups stand for larger communities of people. New organizations defined by constitutions, laws, policies, and procedures created numerous bureaucratic small group structures—from Supreme Courts to city councils. At the dawn of the third millennium, increasingly diverse styles of families proliferate. The nature and role of the family are hot. Families are again a significant economic unit, not just as consumers but as joint ventures with two or more income streams. At work, distributed, decentralized, flexible organizations are replacing co-located-only groups. The technological capacity to share information and the staggering increase in the ability to communicate provide fertile soil. Virtual teams, the new boundary-spanning, task-oriented working groups born of the Information Age, abound. Buckman Labs is a sea of virtual teams that constantly form and dissolve. To solve a customer problem, a global virtual team comes together without anyone chartering it. The group includes anyone in the company who chooses to participate on a particular topic. When the discussion is over, the virtual team disbands. Buckman’s teams are quite different from traditional task groups comprising people from the same organization functioning in the same place at the same time—the conventional 9 to 5 office and the assembly line 7 to 3 shift of industry. Virtual teams come in different varieties, each with unique characteristics, that require nuances of behavior to be effective. Distributed teams comprise people in the same organization who work in different places. They may operate interdependently, as is the case with Buckman Labs’ research and development operation, distributed across all the company’s sites. This contrasts with the branches of FleetBoston’s First Community Bank that operate relatively separately albeit under the same brand. Teams with members in different places clearly have to solve the distance problem, and the further away the bigger the distance problem. Perhaps just one person is situated remotely. Perhaps several are. Sometimes everyone is in a different place. It’s all relative. The ability to work at a distance reshapes the traditional headquarters-field relationship. Under the old model, site managers belong to the same organization but rarely work as a team. Indeed, branch offices, one familiar example of de facto distributed teams, often are encouraged to compete in a system that pits one against the other in the effort to maximize output and beat quotas. When branches work together, however, they form virtual teams of people in the same organization situated in different places. The 47 branch managers of First Community Bank forms a team among themselves to address common service issues and to develop cross-branch priorities based on their own needs and shared learning. Branch teams face the same problems of crossing space and time as more organizationally-diverse virtual teams. Local inter-group boundaries are sometimes more difficult to bridge than more distant affiliations because of competition over contiguous organizational borders. Even if not distributed in space, virtual teams can be spread out in time. Teams of shifts and groups of managers and professionals-on-the-move share facilities–people in the same organization who use the same place at different times–but are not really co-located. In traditional Industrial Age co-located teams, people work side-by-side in the same space at the same time on interdependent tasks for the same organization. Several decades ago, even before the new communications technologies were widely available, one form of virtual team begins to appear, the cross-functional team. Today, cross-organizational teams are common. They comprise people from different organizations who work together in the same or different places. At Buckman Labs, an informal group of people—who number “between four and fifteen,” according to Buckman Lab’s Alison Tucker—all work in Memphis but for different Buckman organizations. Though their task is to brand the company’s products, only some members of the team are from marketing. In the classic cross-functional group, experts and stakeholders come together to solve problems or seize opportunities that require cooperation across organizational boundaries. Shell’s Strategic Initiative Teams (see Chapter 2, “Networks”) that come together physically to develop a new organizational strategy for the 100-year-old company includes geophysicists, financiers, marketeers, production superintendents, executives, organization development consultants, and boiler makers. They continue their regular jobs while devoting the equivalent of another full-time job to the new Shell initiative. As organizations span greater distances, the option to co-locate people shrinks even as the ability to work at-a-distance grows. Relocation itself is increasingly difficult because of people’s unwillingness to move and spiraling costs. Shortening project timeframes underscore the lack of cost justification for moving people. Today's teams must form while remaining spread out. Of greatest challenge are those teams that are both distributed and cross-organizational, involving people from different organizations who work in different places. Most work combines a pattern of individual and group tasks, time spent working alone and time spent working with others. For most virtual teams, synchronous interaction—shared time—is a scarce resource, whether face-to-face or at-a-distance. For best results, time together is planned, prepared for, and followed-up on. Time creates a complication that not even instantaneous communication can solve. As distance and time-zone crossing increases, the window of synchronicity in the work day compresses. New England is six hours behind Europe, and people in California leave work just as their counterparts start their next day in Japan. Even when real-time interaction is possible technically, it may not be practical. Without face-to-face or other real-time interaction, this extreme but increasingly common form of virtual team tests the limits. How it deals with contentious issues virtually is as important as how greatly it shines in sharing information and solving technical problems. Do you participate in or know about a virtual team? 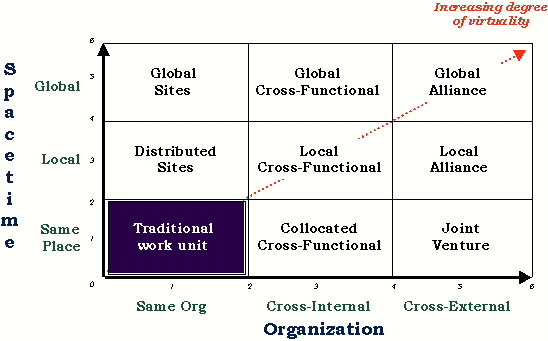 Where would this team or others fit on the two cross-boundary scales in Figure 3.2? Use the numbers along the side to mark judgments you make. Multiply the two scores to create a simple “Virtuality Index” for comparing different teams and networks. Is there a starting point for boundary-crossing? “Headquarters and field” typify the common pattern of distributed work. “Here” may be the organization and place where the leader sits, the bulk of the team has workplaces, and/or where the sponsor or support system is located. Increasingly, however, no place is home (the zero point of each dimension), and everyone is relatively virtual. Then it is especially important to quickly open and populate an online place to contain the team's identity. The subscore on each dimension gives an indication of the general degree of difficulty the team will face in working virtually. A virtual team is distributed in space and time, but from the same organization, is likely to find that communications and participation issues dominate its development. Consider how much time the team will spend together (synchronous) and how much asynchronous interaction it requires. A co-located, cross-organizational team is likely to experience difficulty with establishing common purpose and making decisions. Typically, you will need more time, more cycles, and more patience to deal with the details as you translate broad shared mission into goals and tasks. Virtual teams that are both distributed and cross-organizational will experience both stretched communications and stressful purpose-setting. These teams are most in need of new ways to work and technology support infrastructures. By implication, traditional work means that people speak the same language and take their nonverbal cues from the same broader culture. Today even when people are in the same location the chances are high that they speak different languages. Virtual teams break this traditional cultural boundary mold. When people occupy different places and come from different organizations, they can be certain that they will have to communicate across culture and custom with different languages. The language differences that virtual teams have to contend with are not all born of different country tongues. Two people from different professional upbringings can have almost as much problem communicating as two people who grow up speaking English and Japanese. When teams go global, their language and culture issues clearly loom larger. However, all teams of the future will have to cope with the fact of increasing diversity in the workplace. Not only is the workforce becoming more diverse, but the task requirements of complex work demand that a more diverse group of people works together, whether in traditional settings or in virtual teams. Sometimes co-located teams have even greater difficulty dealing with variations of language and culture than do virtual. Because they are less aware of their communication barriers, co-located teams do not necessarily create appropriate compensations. There is an analogy here to the relationship between distance and collaboration. Data show that people are somewhat less likely to communicate with a colleague upstairs in the same building than with one in another building.11 When people know they are at a distance—culturally and linguistically as well as spatially—they are more conscious of the need to be explicit and intentional about communication. More often than not the first issue that arises for people working virtually is trust. 1 Ironically, the year we date the "birth" of the Information Age (see Chapter 2). 5 Interview with Sheldon Ellis, director, Bulabs Learning Center, Memphis, TN, October 7, 1999. 6 Interview with Edson Peredo, Buckman Labs, Memphis, TN, October 8, 1999. 7 As recently as the mid-1980s, the standard model of small groups requires a hunt through research in anthropology, sociology, organizational psychology, and management. At that time, there is building consensus that a small group is a coherent system that one could study independently at the crossroads of several disciplines, but it is was not a well-developed field. A decade later, a search of the literature on groups and teams turns up a coherent field of research. Source: VT97, c. 3. 8 A 1996 summary of current research quotes a respected researcher’s 1984 review of the literature with approval. 9 An oft-quoted research definition of teams offers the three small group characteristics together with a task-oriented purpose: “Teams are distin­guishable sets of two or more individuals who interact interdependently and adaptively to achieve specified, shared, and valued objectives.” Guzzo et al., Team Effectiveness and Decision Making in Organizations, (San Francisco: Jossey-Bass, 1995), pp. 13 and 115.